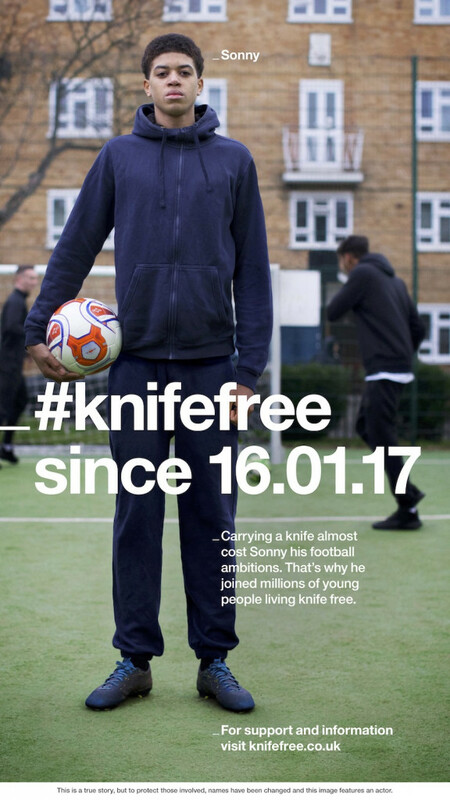 The Home Office has launched an advertising campaign that aims to turn people away from knife crime and pursue positive opportunities instead. It comes as six people, five of them teenagers, were admitted to hospital in five separate knife attacks in London on Thursday (5 April) alone. The youngest was a 13-year-old boy. 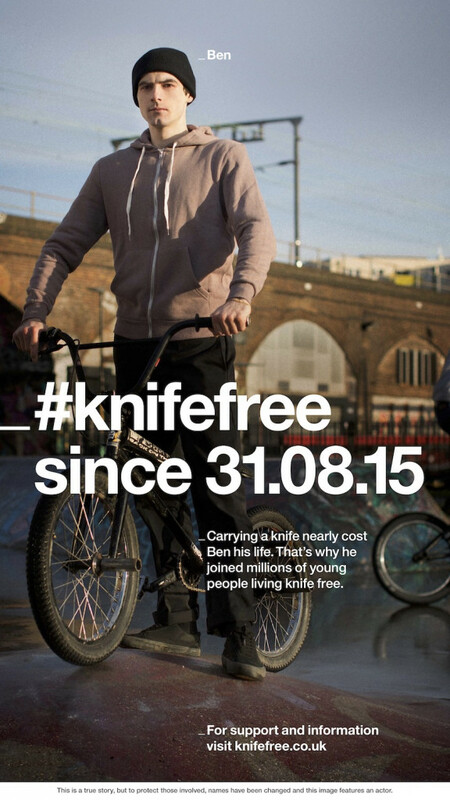 By using real-life stories of young people who made the decision not to carry knives, the £1.35m #knifefree campaign – launched on 23 March before the most recent attacks happened – aims to inspire young people to pursue positive alternatives. It uses advertising on Snapchat, Twitter and on digital channels (TV on demand and Spotify) to target 10 to 21-year-olds. Posters will also be displayed in English cities where knife crime is more prevalent. The adverts feature real-life case studies who have turned their lives around after deciding to go knife-free. One boy featured, Sonny, was an aspiring professional football player when he was stabbed five times during a fight at a party. He was carrying a knife at the time. Research commissioned for the campaign found that real-life stories of young people talking about their experiences with knives were most likely to resonate with the target audience. 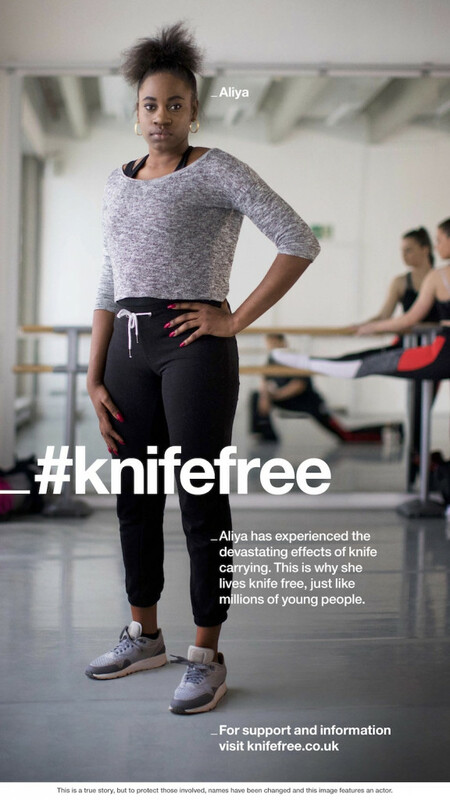 The ads point young people to a website (www.knifefree.co.uk) which provides advice, signposts support services and highlights activities to ‘empower young people to change their behaviour’. Patrick Green is chief executive of the Ben Kinsella Trust, a charity that aims to tackle knife crime. He said: “It is vitally important that we help young people understand the dangers associated with carrying a knife. A knife won’t protect you, it doesn’t give you status; harming or stabbing someone isn’t a trivial act. The campaign forms part of the UK government’s forthcoming Serious Violence Strategy, which will set out action to tackle serious violence by placing new emphasis on steering young people away from crime. Home secretary Amber Rudd said she hoped the “emotional” stories would bring home for young people the options available if they choose to “live knife-free”. While the causes of spikes in crime are complex, many have suggested that recent cuts to services such as Sure Start children’s centres, the Education Maintenance Allowance and tax credits are likely to have played a part in some young people turning to gangs, local identity wars and crime. Scotland Yard has said it is conducting a total of 55 murder investigations so far this year. At least 35 of those killed were stabbed. Evan Jones, head of community services at St Giles Trust, a charity that helps disadvantaged people find jobs, homes and support, added: “Our staff see the effects of knife crime every day – from convictions for carrying a knife that can blight a career, all the way through to meeting a young person who has suffered life-changing injuries as a result of an assault by a rival gang. In February the Home Office announced a new round of its knife crime community fund and increased the money available to charities to £1m. The government has also consulted on new laws on offensive and dangerous weapons, including banning online stores from delivering knives to residential addresses and making it an offence to possess certain weapons in private. Discover the good news that matters.